Want a quick and easy hair style, perfect for these dog days of summer? Well look no further my Sweeties! With about 5 minutes of prep before bed, you can get amazing beachy waves that last all day. Because they are meant to be imperfect, if you get a bit frizzy from humidity it won’t ruin the style! I tested several methods of heatless curls and this is the one that worked the best for me. The methods where you make Princess Leia buns always left the bottom half of my hair with wonky curls, but that might have been operator error. Step 1 – start with damp, not wet hair. I washed my hair, added some product to help the curl, and let it dry about halfway before I started this. Step 2 – section your hair into two equal parts going straight down the back of your head like you would for pigtails. Step 3 – separate each section into two again, and wrap the hair around itself until you have twisted all the way to the ends. Now I have a ton of layers so I took the front section and twisted it back, starting at my temple and ending behind my ear. If your hair is more one length or longer layers, you can skip this part! Step 4 – bring the ends of the twist towards the crown of your head and pin into place. I used one large bobby pin on each side. Now off to bed for your beauty rest! Optional – wrap your head in a scarf before you snooze. I use a silk scarf when I sleep in curlers/braids to help reduce the frizz and keep the hair in place. Step 5 – in the morning, unpin the twists and gently loosen the twists with your fingers. I did a very gentle tease where the hair was parted in back. Add some hairspray and done! Photo: Top Right – how your hair will look pinned up from the back. Top Left – how it will look from the side (note my extra twist in the front). 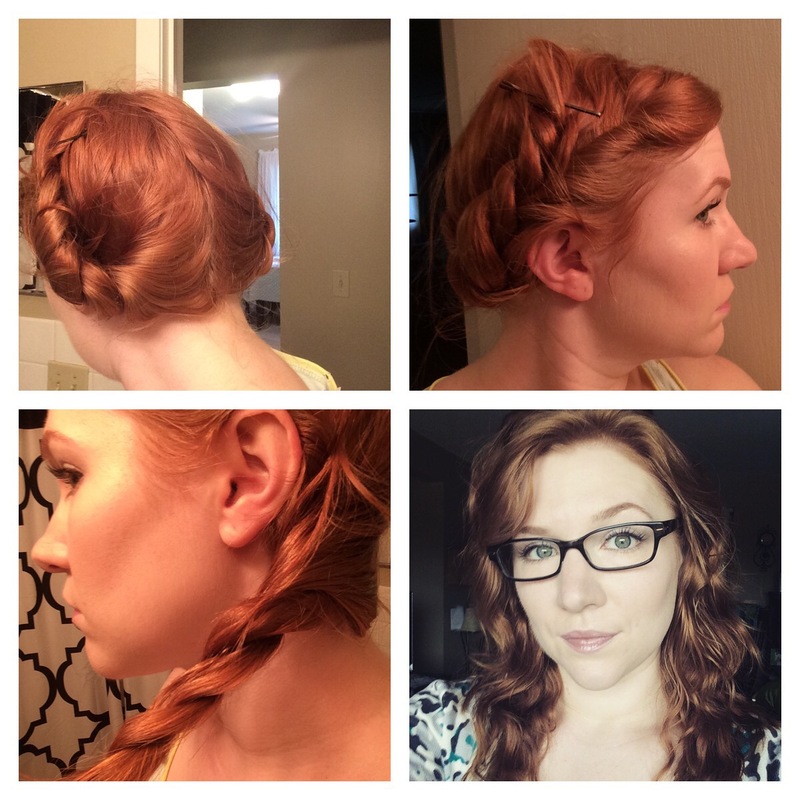 Bottom Right – how the twists look before you pin them up. Bottom Left – final results!